Two new Advanced Placement (AP) classes, AP Computer Science Principles and the primarily freshman-directed AP World History, alongside policy changes this year, are leading to an increase in the number of AP classes that Maine West students are taking. 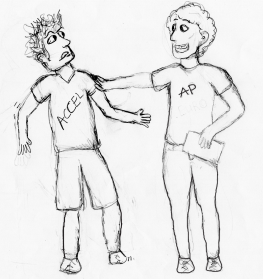 AP classes are popular among ambitious students for two main reasons: they offer a challenge where similar, lower-level classes may not, and they allow students to potentially receive college credit at some institutions. “The learning feels quite fulfilling and I’m looking forward to the material progressing in-depth,” sophomore Maxwell Romza, who is taking AP European History and AP Chemistry, said. His feelings, according to the Washington Post, are reaffirmed by the fact that U.S. Department of Education senior researcher Clifford Adelman showed in 1999 and 2005 that the best predictors of college graduation were not good high school grades or test scores, but whether a student had an intense academic experience in high school. Besides new AP classes, new opportunities are also available for students to take AP classes earlier on in high school. For the first time, AP Chemistry is being highly recommended to rising sophomores excelling in their freshman science class, for example. These rising sophomores are given an opportunity to take Chemistry Accelerated—which would normally be taken during sophomore year—over the summer and then directly take AP Chemistry as a sophomore. AP World History, a new social science class primarily for freshmen, will also lead to an increase in the number of underclassmen taking an AP test, with 81 students in 4 separate periods taking the class. Although not a new class, AP European History has seen a sharp spike in the number of students taking the class, from 30 last year to 81 this year. US History is a required class for all Illinois students, so students at West are restricted to taking AP US History or US History. As a result, many students who may have taken US History Accelerated, if given the option, must now take either regular level or a more challenging course in AP US History. “I think there is a population that is probably not best served by having to be put in an AP class. There is more reading, for sure, more daily prep, more demands each and every day, each and every unit that isn’t really addressed by forcing students to take AP,” McClure said. This “push for AP” classes is not just limited to Maine West; in fact, the rise is so large globally, that the number of AP tests taken has increased from 3.7 million to 4.7 million over the past five years. Some believe that the rise in AP classes at Maine West, and other schools, may be for external reasons. “I think there is tremendous motivation to acquiesce to how newspapers rank high schools, and one of the metrics that they use, of course, is how many students are in AP classes and how many tests are taken. I think in a lot of ways, a better metric might actually [be] ‘how do students do on those AP tests, not necessarily how many people take them, because I think success—and success being at least a 3—is really a good measure of how successful students and teachers are,” McClure said. Indeed, the Washington Post’s rankings of America’s most challenging high schools sorts schools based on the ratio between the number of AP tests taken as compared to the number of graduating seniors, rather than the average score on AP test taken. Over the past five years, the number of Maine West students who took an AP test increased by almost 22%, from 323 to 394. Not only are more overall students taking AP tests, but each individual student is also taking proportionally more AP tests as evidenced by the fact that the total number of tests taken by these students increased by almost 31%. However, the number of students at Maine West earning scores that are 3 or higher—scores that the College Board considers as “passing”—decreased from a high of 85% in 2013 to 74% in 2016. Mathews realizes that only measuring the number of AP tests taken may be a narrow measure, but “teacher quality, extracurricular activities and other important factors are too subjective for a ranked list. Participation in challenging tests, on the other hand, can be counted, and the results expose a significant failing in most high schools—only about 10 percent of the public high schools in the United States qualify for the list,” as they have at least as many AP tests taken as there are graduating seniors. Although Mathews acknowledges the potential for schools to manipulate the rankings by influencing students to take AP courses, he believes that the rankings do more good than harm. “If [schools] did act to raise their rankings, that would only help their school improve. Encouraging more students to take AP classes is exactly what the list was designed to do. AP courses are the only ones in high school which have to be taught at a demanding level because the teachers do not have the power to dumb down the exams. AP courses are important because they give average students a chance to experience the trauma of heavy college reading lists and long, analytical college examinations,” he said.